Rockstar Energy Husqvarna Factory Racing’s Max Anstie has secured an impressive overall MX2 class win at the GP of Belgium, claiming two imposing race winning performances at the brutally rough Lommel track. Confident of strong results at round 14 of the 2016 FIM Motocross World Championship, Anstie didn’t fail to deliver and secured his first double moto winning result of the series to date. 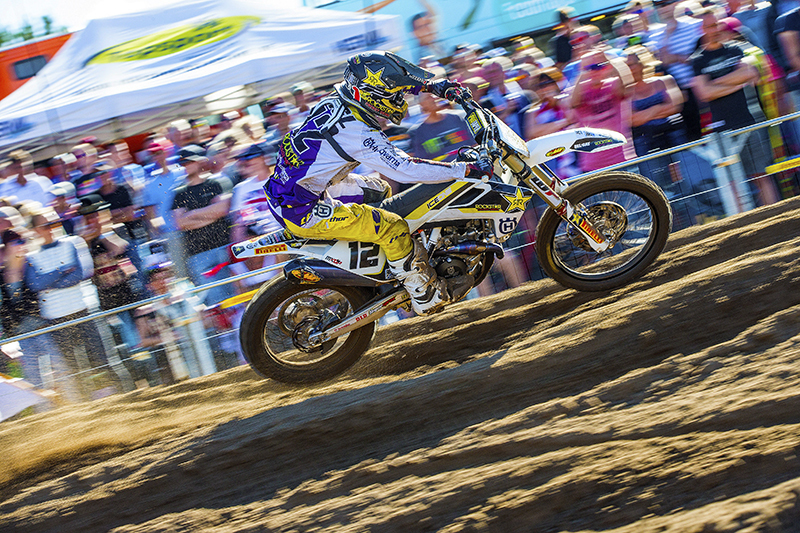 In doing so the Brit became the first rider to win three consecutive Lommel GPs. Putting a high-speed qualifying race crash behind him Max pushed hard during the opening moto to claim a well-deserved win. Again battling against the soft, sandy track conditions in the second moto, he remained both fast and mistake free to put the finishing touches to a perfect GP by securing a second win. For Anstie’s teammate Thomas Covington the GP of Belgium proved to be a difficult one. Struggling with lower back pain prior to the GP, two crashes in the opening moto resulted in a 17th place finish. Frustratingly the second moto was also a demanding one. Conrad Mewse enjoyed two strong outings at Lommel despite a tough qualifying race. Running off track and dropping back to 20th, the British youngster fought back to ninth on Saturday, before going on to finish in 12th and 14th. Overcoming a poor start in moto one, Conrad claimed the holeshot in the second moto, running second for the first 10 minutes of the race.An overall MXGP class win was well within the reach of Husqvarna’s MXGP class rider Max Nagl at Lommel, as the German star continued the impressive form that took him to overall victory at the recent GP of the Czech Republic. Winning the opening moto, the FC 450 mounted rider was well placed to earn a second consecutive overall GP win until a simple fall in a slow speed right hard corner in the second moto resulted in him finishing seventh. Frustratingly for Nagl his 1/7 score resulted in a second overall result, just one-point from the top step of the podium.